We’re proud to be included in Gartner’s brand-new Magic Quadrant as well as receiving high praise from customers for our product’s usability, support, and more. For product-centric companies to be more fully informed about their cloud ERP options, we’re making the report available for free. A brand new Magic Quadrant by Gartner, the world’s leading information technology research and advisory company, is their first focused on cloud ERP for product-centric organizations, and we’re providing the Magic Quadrant for Cloud ERP for Product-Centric Midsize Enterprises as a complimentary download today. The report’s insights into what vendors are producing for the cloud ERP market, how they compare to 14 other vendors, and how the market is going to change will give CIOs and application leaders the data they need to make an informed decision. Gartner focuses in on midsize enterprises, or companies with annual revenue between $50 million and $1 billion, that are located around the world. The analysts note that the move to public cloud ERP solutions by these organizations has outpaced those of large product-centric enterprises (more than $5 billion in annual revenue) though they predict that the use of single cloud ERP suites by these larger companies will increase in the next few years. Acumatica 2018 R1, our first of two annual releases for 2018, was evaluated by Gartner and secured us a spot in the MQ as one of the Niche Players. Surveyed reference customers rated our cloud ERP solution highly for meeting their needs and for offering a wide range of APIs and partner apps. They also praised the flexibility of Acumatica’s cloud xRP platform. The enhancements to our Manufacturing Edition (which supplies integrated production planning, material purchasing, and shop floor scheduling with customer management, sales, inventory, purchasing, and accounting in real time) and our Distribution Edition (which helps users manage quotes/orders, track inventory, and automate business processes while integrating with CRM, Financials, Manufacturing, and Project Accounting) give us confidence that we’ll keep moving up in future MQs for product-centric midsize enterprise cloud ERPs. We’re excited to have been included and positioned as a Niche Player in Gartner’s first-ever Magic Quadrant for Cloud ERP for Product-Centric Midsize Enterprises. We’re also proud of being named a Visionary in their Magic Quadrant for Cloud Core Financial Management Suites for Midsize, Large and Global Enterprises 2018 (with the highest in customer satisfaction of all the vendors surveyed) earlier this year. In addition, Acumatica’s cloud ERP software was ranked as a Leader and highest in Usability—for the third year in a row—by Nucleus Research in their ERP Technology Value Matrix 2018 and topped G2 Crowd’s latest grid report with the highest in User Satisfaction. We encourage you to download Gartner’s newest MQ and the referenced reports to get a complete picture of Acumatica cloud ERP. You’ll see that we’re committed to providing our customers and partners with innovative products, new features, constantly improving functionality, and incredible customer/product support, which includes a variety of research resources such as Gartner’s Market Guide for Cloud ERP for Product-Centric Companies. 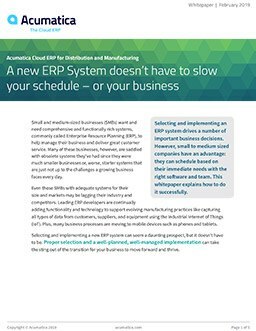 In it, Gartner compares vendors offering cloud ERP software solutions for manufacturing and distribution organizations. The guide combined with Gartner’s new Magic Quadrant can give you the facts as you choose the best cloud ERP and ERP platform for your business. If you have questions about Acumatica cloud ERP or would like a demonstration, we hope you’ll contact us.